If you recall from Friday, I was out of town this weekend. The Hubby, puppy and myself drove up to the mitten state to celebrate my parent's birthdays. The drive is definitely not one of my favorite things and neither is carrying all of our luggage and belongings down 3 flights of stairs to the car. Beside all of that, we had a great weekend with family and enjoyed some pretty great food. We arrived in Michigan at about 7pm after one tank of gas, driving by a horrible car accident, and our brakes smoking it was quite the adventure. After unloading the car we ran to a newer sushi place to grab some carryout. My parents are both ridiculously picky when it comes to food and that is how I was brought up. Of course my taste has changed and I am open to trying all kinds of new foods. When we brought sushi into my parents house, they just gazed at it with disgust on their face. We enjoyed it even if they were not willing to try any. 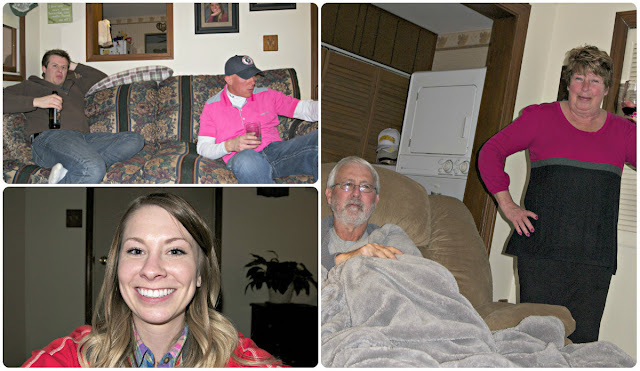 The rest of Friday night was spent relaxing on the couch and enjoying some adult beverages. Saturday we woke up, grabbed our coffee then headed outside so Hubby could look at my car and make sure everything was safe and sound from the brakes smoking. After we got ready, we headed out to have lunch with my in-laws. Last time we were in Michigan, we stayed at their house because we were celebrating my mother and father-in-law's birthday. This time we stayed at my parents house because, well, we were celebrating their birthdays. people we had not seen since our wedding in 2011. When we were done with lunch we went back to my parents house to rest out bellies before dinner. My dad has had a couple of health issues over the past several years and he was just not feeling up for going out to dinner. But, he told us not to let that stop us all from still going out. 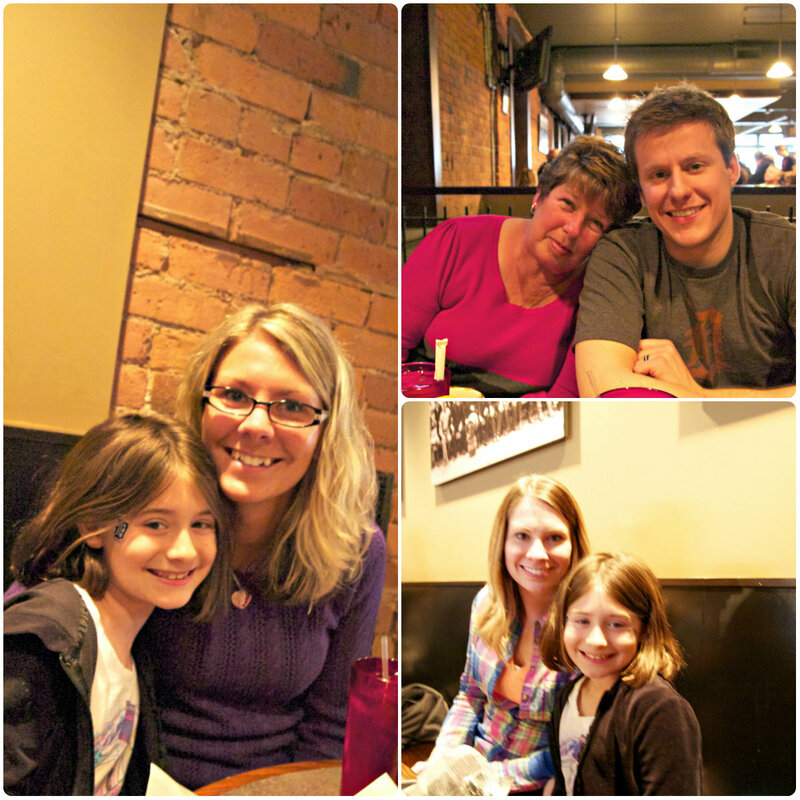 So when dinner time came, we jumped in the car and headed to downtown Detroit. Now some people are terrified of Detroit, but if you know where not to be then you are good to go. We decided upon the Detroit Beer Co. They have amazing beer and even better food. I had no idea that the Tigers were playing that night, I mean it was opening weekend but I didn't realize that, and the restaurant is just down the street from where they play. It just so happened that we got one of the closest parking spots and didn't even have to pay for parking. Amazing! Clockwise: Niece, my sister, my mom, Hubby, me and my niece again. Saturday night was spent at my parents house enjoying adult beverages once more, chatting about adult matters, and socializing the two pups, mine and my sister's dog, who is still a puppy. Roxi the pomchi and Henry the english bulldog in their beds. 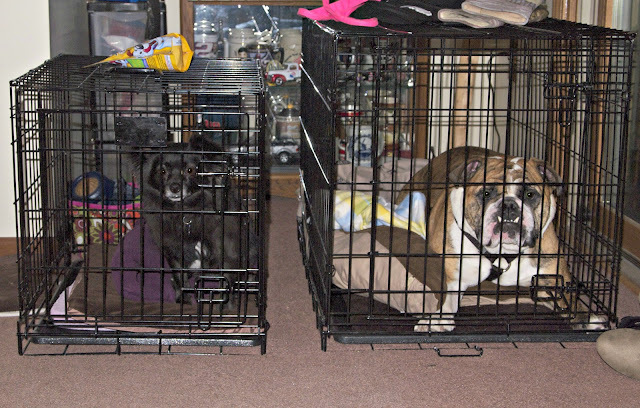 We have walked the two dogs together and now tried having them in their cages next to each other. Do you know of any other socializing techniques for dogs? Clockwise: Hubby, my sister's boyfriend, my dad, my mom, and me. My niece was sitting on the window ledge and we just happened to notice she was right by our high school senior pictures. 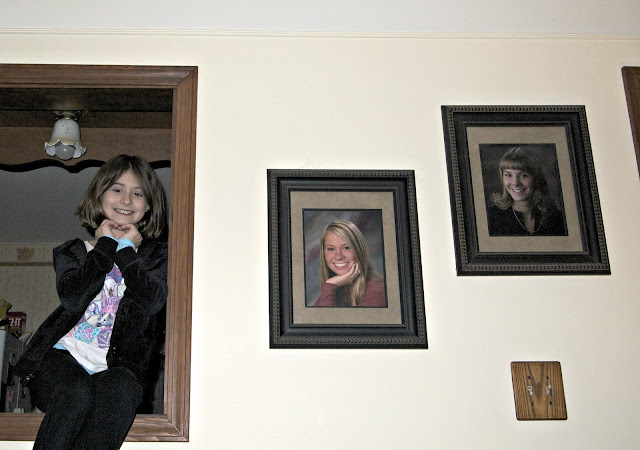 So I snapped this photo and thought it was cool to see her, 9 years, next to myself and her mom's high school senior year pictures. Finally Sunday, the dreaded day of being in the car for another 5+ hours to get home and unpack. Fortunately, the Hubby and I were able to go grab breakfast with my Papa in the morning. Does anyone else call their Grandpa Papa? It was really nice being able to see him and take him out since he is on his own because my grandma passed away a few years back. Awwww...we called my grandfather papa, but like pup-a not pop-a if that makes sense. My grandmother was Italian, donut was papa and nana (more like nonna). What a great weekend!! Glad you got some family time too! !